Photo of adult Glen of Imaal Terrier by Scoo. This file is licensed under the Creative Commons Attribution-Share Alike 2.5 Generic license. Size of Male: 35 lbs., 12.5-14 in. Size of Female: 35 lbs., 12.5-14 in. 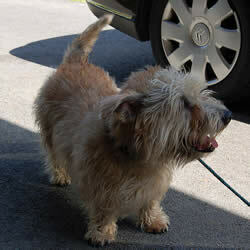 The Glen of Imaal Terrier is from Ireland, where he is a “rough-and-ready” working terrier. These small dogs are used to kill vermin and to hunt badger and fox. They are rugged, courageous and completely focused on finding their game when they’re working. In the home, the Glen is considered docile, calm, devoted and intelligent. They can make good family pets and get along well with children. As the story goes, the Glen of Imaal Terrier began in the 16th century in County Wicklow, Ireland. Elizabeth I sent French and Hessian soldiers to the area and they brought with them certain “low-slung” hounds which inter-bred with local Irish terriers. The result was the Glen of Imaal Terrier. Whether this story is true or not is debatable. But these small terriers do come from County Wicklow and they have been found in the area for a long time. They are a general working terrier and have been used for hunting and killing vermin and for killing fox and badger. Glens were also used as “turn-spit” dogs. The would walk to turn the paddle-like turn-spit over a hearth to cook meats. They are the perfect size for this job and have good endurance to be able to turn the spit for hours. Glens began to appear at Irish dog shows in the late 19th century. Today these rugged dogs are still used as working terriers but they are also popular as good family dogs and pets. The Glen of Imaal Terrier is first and foremost a rugged working terrier. These small dogs have been hardworking terriers in Ireland for centuries and always respected by those who owned them. When working, the Glen is active, agile, silent and very focused on his job. However, the Glen is also happy to be a loving family pet. In the home he is gentle and devoted. He makes a good family companion and is very good with children, especially older children. With other pets in the family, he may not be a good choice. With his strong hunting instincts and prey drive he is apt to chase and kill other small animals. He may be taught to respect cats, especially if he is raised with them from a young age, and if the cat stands up for himself. The Glen is usually very calm in the home but they are playful and they do need plenty of regular exercise. They don’t bark a lot but they will alert you to the presence of a stranger. They are diggers and this habit may be hard to break. The Glen is usually easy to train and they like to learn. Living Environment – The Glen of Imaal Terrier can do fine as an apartment dog. They are small in size and they rarely bark unless there is really something to bark at. They do need plenty of exercise. They will also appreciate having their own yard, though they do like to dig. They can do okay in a kennel but they prefer being with people. Their coat usually protects them in most kinds of weather. Grooming – This dog breed needs to have his coat stripped twice a year. In order to keep him tidy and clean you should regularly remove hair from under his tail, inside his ears, and from between his paw pads. He is a harsh-coated breed so don’t bathe too often. When bathing, use a shampoo designed for his coat type that won’t make the coat too soft. Diet & Exercise – This breed has normal dietary needs as a puppy but it is said that they need a low protein diet once they are adults. Consult with your dog’s breeder about the best diet for this breed. They do require plenty of daily exercise. Walks will not provide them with enough exercise. They need to have a good run. Be careful though: if you allow them to run off-leash, make sure it is in a safe, enclosed area. This breed has a strong prey drive and they will chase and kill other small animals. If they see an animal while off-leash they will likely pursue it and they won’t return when you call them. Health – Health concerns include progressive retinal atrophy, canine hip dysplasia and skin problems. If you are interested in this dog breed you should talk to a breeder about possible dog health problems. The Glen of Imaal Terrier is considered a very intelligent breed and dog training is said to be easy. However, they are also said to be slow to mature, so it may take a while for you puppy to grow up. He may not be willing or able to focus on adult training lessons until he is a little older. When he’s young you should focus on socialization such as teaching him to like cats and to accept petting from friendly strangers. As he gets a little older you can work on basic dog obedience training. Work in short sessions. Your Glen will learn more from some short, fun lessons than from one long marathon session. Glens can also be sensitive dogs so harsh methods won’t work with them. Use positive dog training methods (praise, reward) and you should have no trouble training your dog.